September 24, 2018 at 8:16 am EDT | by Lou Chibbaro Jr.
Two gay men were attacked and beaten by five unidentified suspects who shouted anti-gay slurs on the 2000 block of New Hampshire Avenue, N.W. on Sunday, Sept. 16 at a location less than two blocks from the Third District D.C. Police Station, according to a police report. The report says the suspects included four men and one woman who jumped out of one of two vehicles that had been driving past the men at a location where 16th Street, New Hampshire Avenue, and U Street, N.W. intersect between 9:30 p.m. and 9:45 p.m. Witnesses described the vehicles as a black sedan and a red sedan, said Lt. Brett Parson, who oversees the police LGBT Liaison Unit, which is assisting the investigation into the incident. The police report says one of the victims was knocked unconscious and was “bleeding profusely from the face.” He was taken by ambulance to Howard University Hospital where he was treated for his injuries, the report says. The second victim suffered less serious injuries to his face and head that didn’t require hospitalization, the report says. The incident took place less than two blocks from the Third District Station located at 1620 V St., N.W. Officers responded to the scene of the attack within minutes after witnesses called 911 and after the suspects drove away, the police report says. The victims, William Southern of Laurel, Md., and Robbie Barletta of D.C., identified themselves on social media postings in which they described what they called a harrowing experience. In a Facebook posting, Barletta said the attack occurred while they were walking home from an event near Dupont Circle organized by the Stonewall Kickball LGBT sports league. The leader of the Stonewall sports league posted a separate message saying Southern and Barletta were wearing the sport group’s shirts that include the word “Stonewall” on them. “Everything was and is a blur…but I cannot forget the confusion, fear, and sadness I felt in this moment,” Barletta wrote in his posting. “I was lucky to walk away with a huge headache and a black eye,” he wrote, adding that he and Southern plan to take positive action to draw attention to hate crimes. “The four men and the lady brutally attacked myself and my friend,” Southern wrote in a posting on Instagram. “I was sent to the ER where I received stitches to pull my lip back together,” he said. “But the moral of this story is not that it happened or for people to feel sorry for me. This is a statement,” he continued. The police report says the incident began when Southern and Barletta, whom the report lists as Victim 1 and Victim 2, were walking on U Street, N.W. toward New Hampshire Avenue. “As Victim 1 and Victim 2 entered the crosswalk an unknown vehicle almost collided with them while making a right turn from U St. onto New Hampshire Ave., N.W.,” the report says. “After the near miss, Victim 1 hit the vehicle with his open hands yelling at the driver, who drove away north on New Hampshire Ave.,” the report continues. Parson told the Washington Blade that since the time the report was written investigators obtained new information from witnesses indicating that the first vehicle that nearly struck Southern and Barletta also stopped at the scene and some of the suspects may have been riding in that car. Parson said witness accounts indicate both of the vehicles were sedans, with one being red in color and the other black. “And unfortunately, we don’t have any consistency on make, model, or tag numbers,” he said. The police report says the incident has been listed as a suspected anti-gay hate crime. 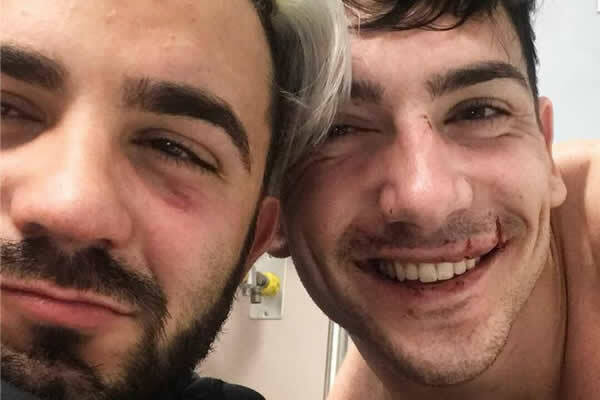 It doesn’t say whether Barletta or Southern told police why they think the attackers perceived them as being gay or whether they thought the attackers recognized the name Stonewall on their shirts as a gay associated name. Barletta and Southern couldn’t immediately be reached by the Blade for comment. The incident marks the sixth time since April 15 that one or more male suspects have attacked male victims in D.C. while shouting anti-gay slurs. However, the latest incident in which Southern and Barletta were attacked is the first such incident reported this year in which a woman was among the alleged attackers. 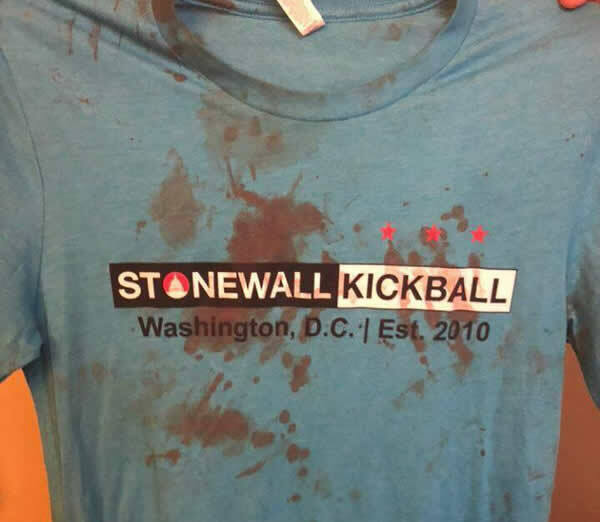 The first of the string of known D.C. assaults against gay men this year also involved two Stonewall Kickball league members. The two were attacked by three unidentified male assailants on April 15 at the intersection of Vermont Avenue and U Street, N.W. at about 12:30 a.m.
Tim Jucovy, the commissioner of D.C.’s Stonewall Kickball League, announced on a Facebook posting that he and other Stonewall members plan to organize a series of events and meetings to draw attention to hate crimes, especially anti-LGBT hate crimes. “We are planning to hold an interactive discussion with experts in the areas of bias-related crime awareness, prevention, counseling, and support from the National Center of Transgender Equality, the Police Department, and other organizations on Monday, Oct. 15,” he said in the announcement. He said details about the time and location would be announced soon.